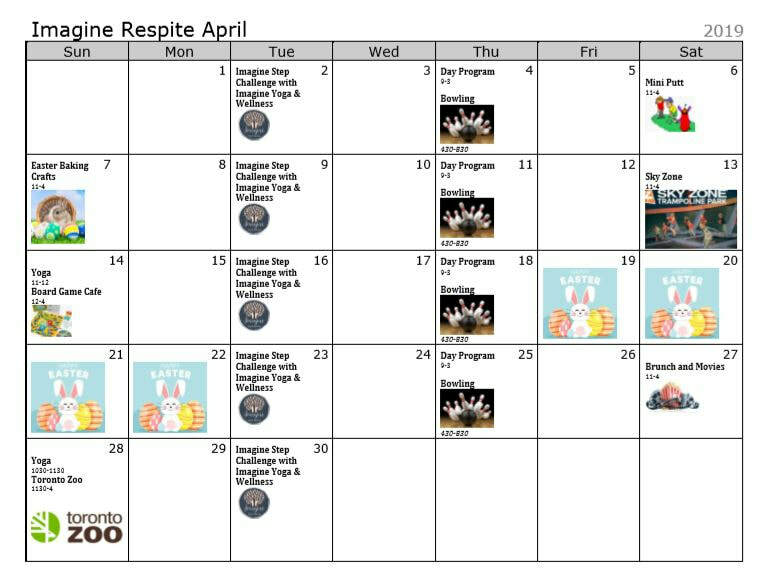 Outings and Activities - IMAGINE RESPITE SERVICES INC. Participant drop off and pick up is usually located at Lawson and Meadowvale (Scarborough). Meals and Activity costs are included in all program fees, unless otherwise specified. It is recommended that each participant has a little extra spending money to purchase additional items. A number of our activities and outings are wheelchair accessible. Participants prepare & cook meals, set the table, serve dinner, eat and clean up while hanging out with friends and learning essential life skills. After dinner, the group will research and pick out a recipe and create a shopping list for the next scheduled Eats N’Peeps. Light lunch and Mini Putt at an indoor or outdoor facility, weather depending. Please pack snacks and a water bottle. Light lunch and a movie – new release, to be confirmed the week before. Please pack snacks and a water bottle. Everyone has talent in some way or another. We are all good at something. Perhaps you can discover yours while participating in various activities such as art, music, dance, cooking and building. Bring an object from home or have something ready to perform that demonstrates something you are good at and enjoy doing. Have you earned a medal from a sport or built a creative invention or craft? Share with friends at the talent show. Light lunch and and bowling (5 or 10 pin depending on lane availability). Please pack snacks and a water bottle. Ladies can always use some time together without the men! A night where the ladies get together, socialize, snack and watch movies of their choice. Every lady enjoys a night away from home from time to time. Ladies sleep over and have more fun hang out time in the morning while enjoying a delicious breakfast and some quiet activities. Participants do art and crafts that are fun to create and more about the process rather than the actual outcome. Some ideas are taken straight from the 1990's British television show "Art Attack". Spend the day at a local beach enjoying the sights and sounds of Nature. We will be busy playing beach games, picnic lunch, swimming, nature walks and exploring the area. ​Cottage is located 1.5 hours from Toronto on Pigeon Lake, Peterborough. This is a private lakefront cottage, with two bedrooms, 1 bathroom, full kitchen, living room and dining room. There is laundry available onsite. Fees include transportation, food, activities and accommodation. ​Participants will enjoy the outdoors while playing some games such as beach volleyball, badminton, sky darts and bowling. The group will reenergize with a scrumptious picnic lunch at a nearby park while listening to some relaxing music. The fun will continue with water games and more outdoor play! Sunscreen, hat, towel and extra shirt is recommended. ​Participants will create summer themed art that you can take home and be proud of. The group will enjoy the sun and fresh air while painting on a sidewalk followed by cooling off with some Freezies. It will be a fun day of hanging out with friends and enjoying a delicious BBQ lunch. Light Linch and Holiday Scavenger Hunt - Send along a mall small list of presents & money, and participants will help one another find the items on our list. Enjoy making crafts and baking snacks that celebrate the winter season. Eat a winter inspired lunch with friends and take home dessert for family to share....or keep it for yourself.